While there are many reasons for the on-call physician shortage, many observers believe that the current crisis has been exacerbated by the law that firmly established the "safety net" more than 20 years ago — EMTALA. Congress passed the Emergency Medical Treatment and Active Labor Act (EMTALA) in 1986 in response to widespread reports that hospital EDs were transferring uninsured and indigent patients to public hospitals, a practice also known as dumping. 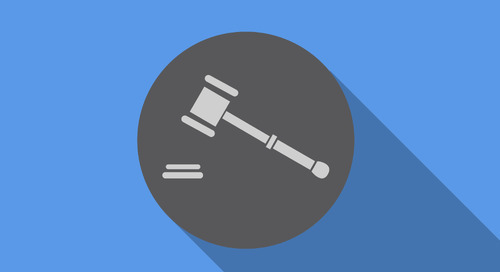 Though EMTALA primarily requires hospitals that receive federal funds to perform certain acts, the law also applies to physicians who are on-call for the ED. On-call physicians who fail or refuse to respond to the ED within a reasonable time after notification are subject to fines of up to $50,000 per violation. This article will discuss the obligations of physicians who are on-call for the ED and how they can avoid violating federal law. This article is not intended to be a comprehensive discussion of EMTALA, but an abbreviated summary of physician obligations under the law. For detailed information on EMTALA and how it applies where you practice, please review your hospital's medical staff bylaws, rules and regulations, or policies and procedures. EMTALA imposes two major requirements on hospitals that operate EDs and accept Medicare reimbursement. First, if an individual comes to the ED and requests examination or treatment for a medical condition, the hospital must provide an appropriate medical screening examination to determine if an emergency medical condition exists. Second, if the individual is found to have an emergency medical condition, the hospital must stabilize the medical condition, within the capabilities of the hospital, or transfer the individual to another hospital. Each of the following phrases has a specific meaning under the law. "Each hospital has the discretion to maintain the on-call list in a manner to best meet the needs of its patients." 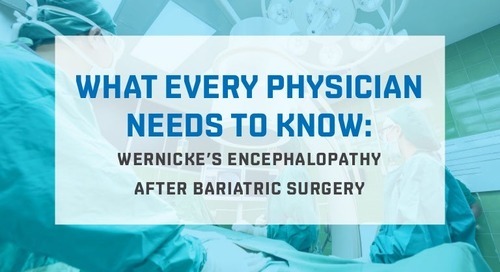 "Physicians, including specialists and subspecialists (e.g., neurologists) are not required to be on-call at all times. 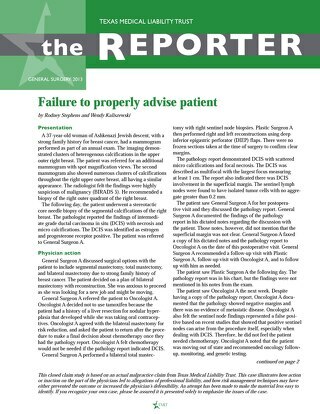 The hospital must have policies and procedures to be followed when a particular specialty is not available or the on-call physician cannot respond because of situations beyond his or her control." "CMS does not require that a hospital's medical staff provide coverage 24 hours/day 365 days/year. 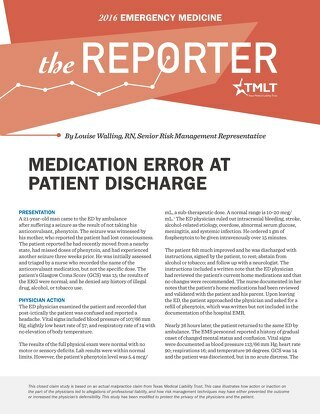 If there comes a particular time that a hospital does not have on-call coverage for a particular specialty, that hospital lacks capacity to treat patients needing that specialty service and it is therefore appropriate to transfer the patient because the medical benefits of transfer outweigh the risks." The clarifications also stated that physicians can schedule elective surgery while they are on call and that physicians can be on call simultaneously at more than one hospital in the community. "A physician responsible for the examination, treatment, or transfer of patients must not sign a certification for transfer that the physician knows or should know is not for an appropriate transfer or misrepresent the patient's condition or other information (including a hospital's EMTALA obligations) in general. I disagree with the emergency physician and I do not think that I need to see the patient. Do I still have to go to the ED? Can I ask the emergency physician to send the patient to my office rather than going to the ED? There are exceptions to the rule. A patient can be transferred to a physician's office if the physicians' office has specialized equipment and capability that the transferring hospital does not have. It is important to note that the CMS rule about treatment in the ED only applies to patients who have emergency medical conditions and are unstable. "It is standard practice in most hospitals for the emergency physician to splint a displaced fracture and send the patient to the on-call orthopedic surgeon's office for reduction and further treatment. . . 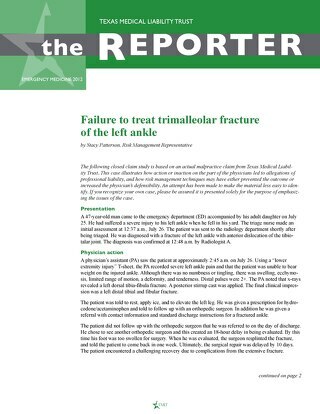 If the emergency physician 'stabilizes' the fracture, EMTALA no longer applies. Does EMTALA require that I accept a patient in my office who was referred to me by the ED for follow-up care even though I was NOT called into the ED to examine or treat the patient. Follow up outside the hospital is not an EMTALA issue, but is instead a hospital bylaw or protocol issue. Most often, hospitals define the responsibilities of on-call physicians with regard to follow-up care of patients seen in the ED. Physicians can determine their specific responsibilities for providing follow up care by reviewing the medical staff bylaws and medical staff rules and regulations for the hospitals where they maintain privileges. After I treat the patient in the ED, what are my obligations? Once the patient's condition is stabilized or the patient is transferred, the on-call physician's EMTALA obligation ends. (6) However, the physician may still have obligations to provide follow-up care or risk allegations of patient abandonment. I am on-call for the ED and the physician called me to come and treat a patient who has been dismissed from my practice. Do I have to treat the patient? 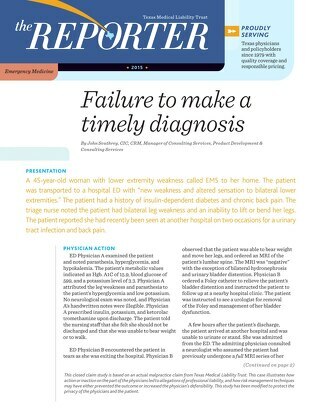 EMTALA applies in this situation and the on-call physician must treat the patient in the ED. 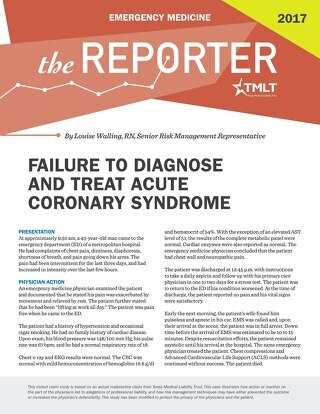 (14) "When this happens, we recommend that the physician send a follow-up letter to the patient saying that though the patient was treated in an emergency situation, the physician-patient relationship remains terminated," says Jane Holeman, vice president of risk management for TMLT. I am the only neurologist in town. Am I required to be on call all the time? According to the EMTALA clarifications released in 2003, physicians are not required to provide 24-hour ED coverage. The case study at the end of this article describes a situation in which an on-call physician was fined for violating EMTALA. The following risk management considerations may help on-call physicians minimize the risk of violating federal EMTALA rules. Make sure your pager or cell phone works. There may be some areas of the hospital where your cell phone cannot receive calls. Be aware of these areas and make alternate arrangements so you can be contacted when working in these areas. The ED physician has the "final word" on what is considered an emergency medical condition, if a patient is stable, and which specialist needs to see the patient. 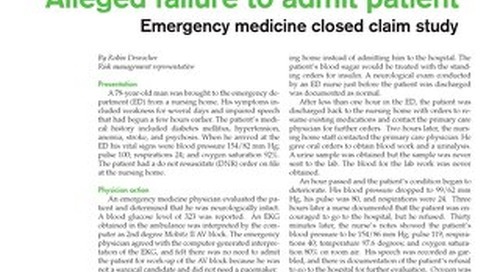 (6) "Deferring to the judgment of the ED physician who has actually seen and examined the patient is a prudent risk management technique," says Holeman. Make sure you understand who is doing what. If after speaking with the ED physician and the two of you jointly decide on a plan of action for the patient, be clear about who will carry out the plan. Will the ED physician order the MRI and then call you with the results or should you call back to get them? If the ED physician agreed to observe the patient in the ED, make sure he or she understands when and under what conditions to contact you if the patient's clinical situation changes. 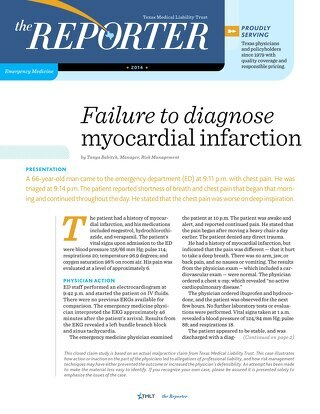 Is the ED physician going to have the on-call internal medicine physician admit the patient or do you need to admit the patient? Be clear and explicit. Document the discussions with the ED physician. Lack of documentation can make it difficult to determine what was said during conversations between ED and on-call physicians. Discrepancies can occur and to avoid them it is recommended that on-call physicians document these conversations. Be familiar with your hospital's medical staff bylaws and the conditions of your hospital privileges. These may spell out your obligations to provide follow-up care to patients seen in the hospital's ED. If you ask to see a patient in your office instead of going to the ED and the ED physician agrees with this plan, treat the patient as agreed. There have been situations in which a specialist agreed to treat a stabilized ED patient in the office, but then refused to treat the patient for economic reasons when he or she came for care. Though EMTALA may not apply in this situation because the patient is stable, from a risk management standpoint, this is not a good practice. 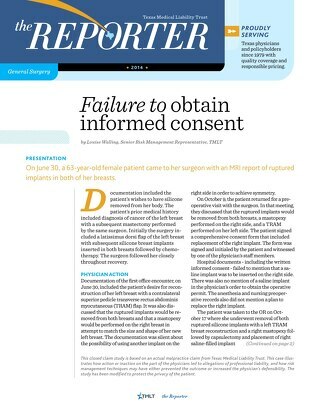 "By agreeing to see the patient and then refusing when the patient arrives, the physician may open the door to allegations of patient abandonment or medical liability in the event of a bad outcome," says Holeman. Though it has been in place for more than 20 years, EMTALA and the many obligations it creates continue to cause confusion. The 2003 clarifications were designed to alleviate some of this confusion, but . . . "the impact of the EMTALA amendment on the supply of and access to on-call specialists is not clear. Many believe that access to on-call specialists has worsened as a result. In 2005, CMS convened a technical advisory group to study EMTALA. "The advisory group focused on incremental modifications to EMTALA, but also envisioned a fundamental rethinking of EMTALA that would support development of regionalized emergency systems. A pregnant woman arrived in the emergency department (ED) at Hospital A at 4 p.m. She was at or near term with her sixth child. She was experiencing one-minute, moderate contractions every three minutes and her membranes had ruptured. Two obstetrical nurses examined the patient and found she was in labor and had high blood pressure. The patient had received no prenatal care, did not have a physician, and did not have health insurance. The obstetrical nurse called Ob-gyn A, who was on-call to treat unassigned obstetrics patients. When Ob-gyn A was told of the patient's history and condition, he told the nurse that he "didn't want to take care of this lady." He asked the nurse to prepare the patient for transfer to Hospital B, which was 170 miles away. Ob-gyn A said he would call back in five to 10 minutes. The obstetrical nurses told the nursing supervisor and hospital administrator of their belief that it would be unsafe to transfer the patient. When Ob-gyn A called back, the nurse told him that according to hospital regulations and federal law, Ob-gyn A would have to examine the patient and arrange for Hospital B to receive her before she could be legally transferred. The nurse also asked for permission to start magnesium sulfate. Ob-gyn A told the nurse to begin administering the medication only if the patient could be transported by ambulance. Ob-gyn A arrived at 4:50 p.m. and examined the patient. The examination revealed that the patient had ruptured membranes, was dilated 3 cm, and the fetus was "smaller than usual." Her blood pressure was 210/130 mm Hg and the physician was concerned the patient had been hypertensive throughout her pregnancy. He arranged for the patient's transfer to Hospital B, which was better equipped to handle any complications that might occur as a result of the mother's hypertension. The nurse was ordered to begin magnesium sulfate and have the patient transferred by ambulance. At 5 p.m., the nurse showed Ob-gyn A the hospital's EMTALA guidelines, but he refused to read them. 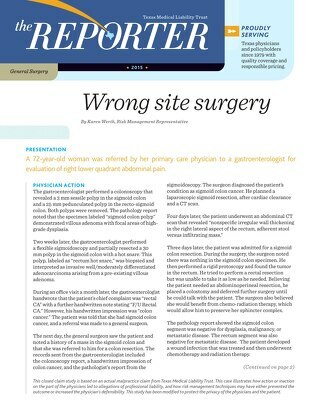 He told the nurse that the patient represented more risk than he was willing to accept from a malpractice standpoint. The nurse explained that the patient could not be transferred unless Ob-gyn A signed a hospital form titled "Physician's Certificate Authorizing Transfer." Ob-gyn A signed the form, but did not complete the certificate. He told the nurse that until the hospital "pays my malpractice insurance, I will pick and choose those patients that I want to treat." Ob-gyn A went to care for another unassigned patient and the nurses arranged for the transfer. The patient's blood pressure was 173/105 mm Hg at 5:30 p.m.; 178/103 mm Hg at 5:45 p.m.; 186/107 at 6 p.m.; and 190/110 mm Hg at 6:50 p.m.
At 6:50 p.m., the patient was wheeled to the ambulance. Ob-gyn A did not re-examine her before she was taken to the ambulance and he did not order any medication or life support equipment for the patient during transfer. An obstetrical nurse and two emergency medical technicians accompanied the patient. Approximately 40 miles into the 170-mile trip to Hospital B, the nurse delivered the baby in the ambulance. She directed the driver to a nearby hospital to obtain pitocin. While at that hospital, the delivering nurse called Ob-gyn A, who ordered her to continue to Hospital B despite the birth. In accordance with the patient's wishes, the ambulance returned her to Hospital A where Ob-gyn A refused to treat her. He ordered that the patient be discharged if she was stable and not bleeding excessively. Another ob-gyn examined and admitted the patient. Three days later, the patient and her baby were discharged in good health. As a result of the events in this case, HHS determined that Ob-gyn A violated EMTALA by ordering a woman with hypertension and in active labor with ruptured membranes transferred from the ED of one hospital to the ED of another hospital 170 miles away. The physician was assessed a penalty of $25,000. Ob-Gyn A appealed the decision, claiming that the patient received all the care that she was due under EMTALA because he stabilized her hypertension sufficiently for transfer and she was not in active labor when she left the hospital in the ambulance. An administrative law judge (ALJ) upheld the fine, but reduced it to $20,000. The HHS appeals board affirmed the ALJ and the United States Court of Appeals for the Fifth Circuit affirmed the HHS appeals board decision. Based on a review of the expert testimony heard by the ALJ and the appeals board, the court found that the record showed "substantive, if not conclusive evidence" that the patient's hypertension was an "emergency medical condition" as defined by EMTALA. Therefore, the patient required stabilization before transfer. The court found that the evidence supported the determination that Ob-gyn A did not provide stabilizing treatment and violated EMTALA. O'Malley A, Draper A, Felland L, and the Center for Studying Health System Change. Hospital Emergency On-Call Coverage: Is There A Doctor In The House? Issue Briefs No. 115. November 2007. Available at http://www.hschange.com/index.cgi?func=pubs&what=2. Accessed October 6, 2008. American College of Emergency Physicians. On-Call Specialist Coverage in U.S. Emergency Departments. April 2006. 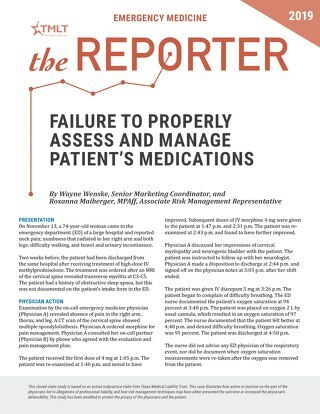 Available at http://www.acep.org/pressroom.aspx?id=25262&ekmensel=c580fa7b_92_134_25262_4. Accessed October 1, 2008. The Joint Commission. Sentinel Event Alert. Issue 26. June 17, 2002. Available at http://www.jointcommission.org/SentinelEvents/SentinelEventAlert/sea_26.htm. Accessed October 1, 2008. Emergency Medicine Practice Committee and the American College of Emergency Physicians. Availability of On-Call Specialists. May 2005. 42 U.S.C. Section 1395dd. Examination and treatment for emergency medical conditions and women in labor. Bitterman RA. EMTALA: Providing emergency care under federal law. American College of Emergency Physicians. 2001; Supplement 2004. TMA Office of the General Counsel. Emergency Medical Treatment and Active Labor Act (EMTALA). June 2007. Available at http://www.texmed.org/Template.aspx?id=6071. Accessed October 1, 2008. Spain D, Bellino M, Kopelman A, et al. Requests for 692 transfers to an Academic Level I Trauma Center: Implications of the Emergency Medical Treatment and Active Labor Act. J Trauma. 2007 Jan; 62(1):63-68. Henry G and the American College of Emergency Physicians. Emergency Medicine Risk Management: A Comprehensive Review. 1997 McGraw-Hill Companies. Centers for Medicare and Medicaid Services. On-Call Requirements-EMTALA. June 13, 2002. Available at http://www.cms.hhs.gov/EMTALA/02_CMS_Guidance_to_State_Survey_Agency_Directors.asp#TopOfPage. Accessed October 7, 2008. Centers for Medicare and Medicaid Services. Medicare Program; Clarifying Policies Related to the Responsibilities of Medicare Participating Hospitals in Treating Individuals with Emergency Medical Conditions. 68 Federal Register 53221-53264 (2003). Available at www.access.gpo.gov/su_docs/fedreg/a030909c.html. Accessed October 2, 2008. American Medical Association. EMTALA Quick Reference Guide For On-Call Physicians. November 12, 2003. Centers for Medicare and Medicaid Services. Limiting on-call responsibility by specialty. 68 Federal Register 53255 (2003). Available at http://www.gpoaccess.gov/fr/retrieve.html. Accessed October 2, 2008. Brockway L. Terminating patient relationships: how to dismiss without abandoning. the Reporter. May—June 2008. Available at http://www.tmlt.org/publications/resources/. Accessed October 6, 2008. Lee TM. An EMTALA Primer: The Impact of Changes in the Emergency Medicine Landscape on EMTALA Compliance and Enforcement. Ann Health Law. 2004 Winter; 13(1):145-78. 934 F.2d 1362. Michael L. Burditt, MD, Petitioner, v. U.S. Department of Health and Human Services, Respondent. No. 90-4611. United States Court of Appeals, Fifth Circuit. July 9, 1991. Available at http://www.medlaw.com/healthlaw/EMTALA/courtcases/burditt-v-hss-decision-fu.shtml. Accessed October 3, 2008. Committee on the Future of Emergency Care in the United States Health System. Hospital-Based Emergency Care: At the Breaking Point. Institute of Medicine. June 14, 2006. Available at http://www.iom.edu/CMS/3809/16107/35007.aspx. Accessed October 6, 2008. American College of Emergency Physicians. EMTALA. Available at http://www.acep.org/pressroom.aspx?LinkIdentifier=id&id=25936&fid=3496&Mo=No&acepTitle=EMTALA. Accessed October 7, 2008. Committee on the Future of Emergency Care in the United States Health System. Hospital-Based Emergency Care: At the Breaking Point. Executive Summary. Institute of Medicine. June 14, 2006. Available at http://www.nap.edu/catalog.php?record_id=11621. Accessed October 6, 2008. Bitterman R. Supplement to EMTALA: Providing Emergency Care Under Federal Law. April 2004. Available at http://secure2.acep.org/BookStore/p-10419-emtala-providing-emergency-care-under-federal-law.aspx.